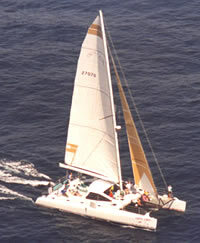 Lohe Lani is a 60 foot sailing catamaran with the ability to house up to eight guests. The Lohe Lani will be your sailing 'hotel', transporting you from spectacular location to spectacular location. A skipper and two crew staff the boat so that you can just sit back, relax, and enjoy the sail while taking in the sights of Costa Rica and its Pacific coast. 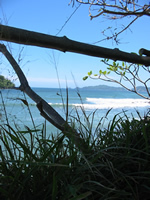 You'll sail the pacific coast of Costa Rica while stopping at coastal (and island) national parks and private reserves. Sail, swim, snorkel, fish, AND hike through rainforests while viewing the varied flora and fauna of Costa Rica. Many locations you'll visit are hard to reach by land transport. So you'll not only have a much more pleasant and relaxing form of transportation, you'll also access places that the multitudes don't, giving you the chance to see pristine plant life; and animals that might otherwise be hiding. We offer itinerary choices of 3- or 6- days so you can make this the focus of your Costa Rica trip, or easily combine it with other adventures. Surfing trips are also offered on the Lohe Lani. See what our guests have had to say about our trips. Costa Rica plays host to approximately 500,000 species of plants and animals. Included among them are howler, spider, and squirrel monkeys, sloths, scarlet macaws, several species of toucans, orchids, and bromeliads. The pacific ocean is home to a wide variety of animal and plant life including coral, fish, dolphins, whales, sharks, rays and sea turtles. 25% of the country’s territory is under some category of protection. There are 58 national parks and reserves as well as many private reserves.